At the time progressives needed her most, she wasn’t there. Elizabeth Warren is seen by many as the heart of the Democratic Party. She bridges the gap between Bernie Sanders and Hillary Clinton supporters. Both sides have sought her endorsement and have large factions within them that want her as the Vice-President. Given the rise of the ‘Bernie Or Bust’ Movement, Clinton and her allies are looking to Warren as a means of delivering progressive votes in November. However, not even Elizabeth Warren can save the Democratic Party should Clinton win the nomination, and any attempt by her to do so will be seen as betrayal in the eyes of progressives who were already let down when she did not endorse Bernie Sanders. 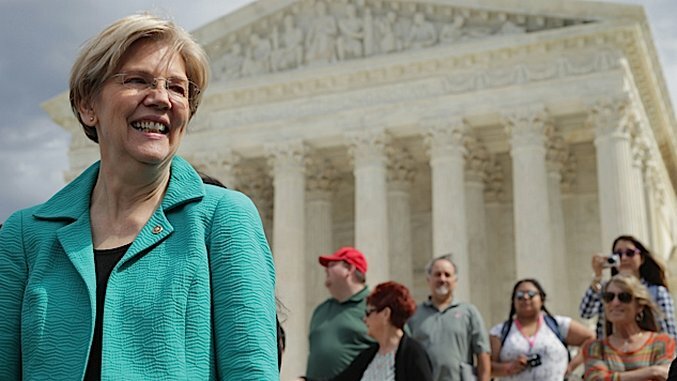 Lately, Warren has been engaging all-but-certain GOP nominee Donald Trump on Twitter rather than weighing in on the issues dividing Bernie Sanders and Hillary Clinton. This has led many to question if she is coordinating with Clinton’s campaign now that the primary is winding down. Though the campaign denies such coordination, many of Sanders’ followers have been angered by the Massachusetts Senator’s actions, feeling they’re premature. It seems clear that Warren’s Twitter arguments are an effort to unite the party. There is a general attitude among Democratic Party leaders (and many in the media) that Donald Trump is electoral poison, and no matter how much people don’t like or trust Hillary Clinton, the prospect of The Donald in the White House is so frightening it will bring Democrats together. But this analysis completely misses why Trump (and Bernie) are so popular, and underestimates exactly how discontented people are. In 1824 populist and political outsider for his time, Andrew Jackson, was denied the White House when Speaker of the House, and presidential candidate Henry Clay threw his support to John Quincy Adams, and was later appointed as Secretary of State. Jackson denounced the result as a “corrupt bargain.” His supporters vehemently agreed, and much to the horror of the political establishment Adams represented, which feared populism as a form of mob rule, and believed the best and brightest should lead, Jackson went on to win in 1828. Similarly, 40 years later, following the impeachment of President Andrew Johnson, and during Reconstruction, another outsider candidate, former Union General Ulysses S. Grant, won. His presidency was met with derision from the establishment. Henry Adams, the grandson of John Quincy Adams and great-grandson of John Adams, derided Grant as stupid and incompetent. Unlike Adams, he had no pedigree; he was a soldier, not the Harvard-educated heir to a political dynasty. Adams believed the election of the popular Union general was the culmination of years of decay in our system that began with the election of Jackson. He blamed Grant for dashing his aspirations to influence American politics, and restore his family’s sensibilities to the political discourse. It is hard to look at 2016 and not hear echoes of this history — but not in so far as Trump will bring about another Trail of Tears (he wouldn’t be able to even if he tried) or corruption on par with that of Grant’s administration. No, the comparison is this: Americans are unhappy, the political establishment is complacent, and populism is on the rise. Economic and political inequality are replacing social issues as the lens through which we define left/right politics. On both sides of the aisle, Americans are fed up with the inequity that has come to define our system which favors wealth and power over popular mandate. After roughly four decades of middle class decline and stagnation while more and more of the total income goes to the top one percent, Americans want change. They are rejecting the current political establishment on both sides of the aisle. With Democratic Party about to saddle itself with a Hillary Clinton nomination after a highly controversial primary many feel has been a corrupt bargain from the outset, fracture in November seems inevitable. Further complicating matters, the party leadership has been lukewarm in its welcoming of Sanders and his supporters. DNC officials recently rejected a request from Bernie Sanders to oust two Convention committee members who are surrogates for Hillary Clinton. What’s more, the DNC Chair and Clinton ally, Debbie Wasserman Schultz, who seemingly designed the debate schedule to minimize exposure, thereby limiting scrutiny against the former Secretary of State while hurting her lesser-known competition, gets to appoint four members to the Platform Committee on top of Clinton’s six. Sanders is only allowed five. Sanders supporters see the 2016 election as a revolt against systemic corruption, and view the current establishment and Hillary Clinton as a part of that corruption. Trump, for all his faults, and in spite of the fact that he is all over the place — releasing a policy platform in line with the current Republican party, but adopting populist rhetoric, hinting at a swing to left for the general election — is not a member of the status quo establishment. Many people, Democrats and Republicans alike, are mad enough to take a chance on change even if that chance simply means shaking the current establishment to its core to remind them what democracy looks like. People are desperate. Clinton’s fundraising team is already finding that small donors are not stepping up in a way that they expected in light of the possibility of a Trump presidency. For her part, Elizabeth Warren cannot bring Sanders supporters and the current establishment together. She cannot erase the history that has led to this moment. All the Massachusetts Senator can do is alienate her own supporters by attempting to do so, and carrying water for the establishment. On top of the email scandal and breaking protocol, Clinton also flouts federal election laws by coordinating with various super PACs. While she is by no means the only politician in Washington who engages in this behavior — due to a string of damaging court decisions and political pressure, the FEC has effectively lost its ability to regulate these kinds of violations — she is the only presidential candidate doing so. It seems fairly clear, given her actions, that Sen. Elizabeth Warren will attempt to be peacemaker at the Philadelphia convention and beyond. These efforts will only undermine the progressive Massachusetts Senator in the eyes of progressives — though it is doubtful this damage will be permanent. However, it is probably still not worth the risk — and taking that risk sends a message.